The purpose of lymph drainage massage is to move fluid out of your tissues into lymph nodes where bacteria, viruses and other harmful microorganisms are destroyed. It reduces swelling and pain and stimulates your immune system, increasing the circulation of white blood cells. There are many lymph nodes in your face and neck, and they protect you against pathogens that can enter your body through your eyes, nose and mouth. Lymph drainage massage mimics the action of lymph vessels. Because so many of your lymph vessels are located right below your skin, use light pressure -- just enough to move the skin without pressing more deeply. Moving the skin helps open the initial lymphatics, which are very tiny lymph vessels with leaf-like cells that open to allow tissue fluid into the lymphatic system. The basic massage movement is a circle with slightly more pressure in the direction of the lymph nodes and lighter pressure as you finish the circle. This helps push fluid inside the lymph vessels into the nodes. You have lymph nodes on your face near your ears and eyes. There is a chain of lymph nodes that reaches from the inner corners of your eyes to your nose. Around the bottom of your head there is a ring of nodes -- the occipital nodes in back at the base of your skull, nodes under and behind your ears and nodes under your jaw line and chin. Lymph fluid that moves from your head into these nodes then drains into two chains of nodes on your neck, leading down toward the collar bone. Eventually lymph, once it has been processed in the lymph nodes, empties into blood vessels near your heart, to circulate around the body again. Lymph massage on the face starts on the neck. Starting just above the collar bone in front of your neck, massage the skin in slow, smooth circles for about a minute. Move up the neck in a line from the collar bone toward your ears, massaging each inch or two for a minute, moving very slowly. Then massage under your chin for about a minute, in slow circles. Think about lightly pushing lymph from under your chin downward into the neck lymph nodes. Massage the nodes under your jaw line on each side for a minute. Massage under your ears for a minute, and then massage the base of your skull. Continue massaging on the face. Move your skin in circles, with a subtle increase in pressure to milk the lymph down toward your jawline, and then lighter pressure as you complete the circle. Cover all of your face, starting with the chin and jawline. 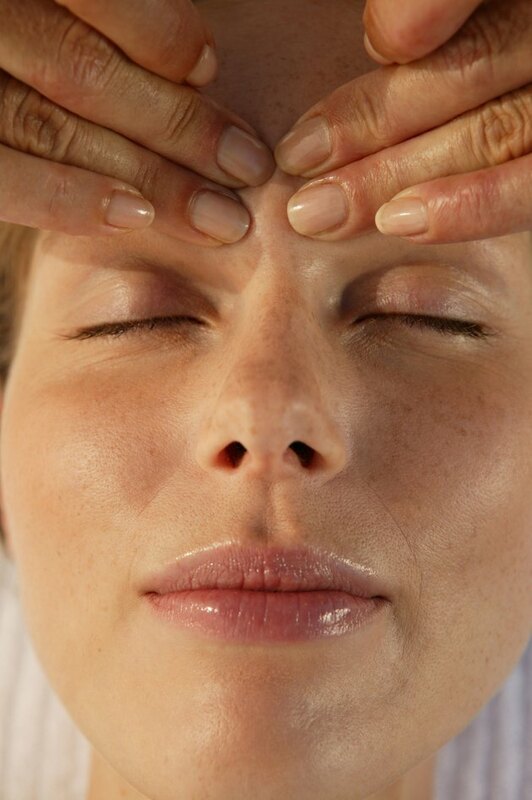 Work your way up to your forehead, continuing the light circular massage. Put your hands on the back of your head and massage the scalp in large, light circles for a minute. Do this again over the temples above your ears and then on the top of your scalp. Finish by massaging the ring of nodes again - under your chin, jawline, ears and the base of your skull. Massage the chains of nodes from your ears down to the collarbone in front of your neck.